On July 7, 2016, a peaceful protest was ending in downtown Dallas. It was a rally like many across the country —sparked by the deaths of black men shot by police in Baton Rouge, Minnesota and other cities. Then, suddenly, the atmosphere changed. A gunman opened fire. Five officers were killed. Nine others, and two civilians, were injured. Here's a complete look at how KERA News covered what happened — from the protest to the shooting to the mourning. KERA profiled each of the slain officers in a series called Remembering the Fallen, and produced hours of coverage broadcast on public radio stations across the country. A man Dallas police wrongly identified as a suspect in the July 2016 shooting that left five officers dead is suing the city of Dallas and the police department. Dallas police quietly gathered in front of their headquarters Friday morning to remember the officers who died in an ambush two years ago. Songs and prayers from four different faiths opened the observance. Along with citizens and officials, police remembered Dallas officers Lorne Ahrens, Michael Krol, Patricio Zamarripa, Michael Smith and DART Officer Brent Thompson, who died on July 7, 2016. A grand jury has declined to bring charges against Dallas police officers responsible for the death of a sniper who had killed five officers during a downtown rally. Outside Dallas City Hall Friday evening, people gathered to listen to music, hear speakers, and later that night, hold up blue lights in the darkness as part of the city's central tribute to the July 7 anniversary. An investigation into the ambush shooting a year ago that killed five Dallas law enforcement officers and injured nine others as well as two civilians will be turned over to the Dallas County District Attorney's office early next week, police officials said Friday. Police officers across Texas will flash their red and blue patrol lights this morning in memory of the Dallas officers who died in an ambush last year. St. Paul United Methodist Church is just a few blocks from where a gunman disrupted a peaceful rally in downtown Dallas last year. Richie Butler, pastor of St. Paul United Methodist Church, said some church members were part of that once-peaceful rally. Only hours after the ambush that killed five Dallas law enforcement officers, mental health experts began thinking ahead, searching for ways to ease the long-term effects of the attack on the men and women who patrol the nation's ninth-largest city. Folks who loved and worked with the five police officers killed last July 7 gathered Thursday to dedicate a memorial called the Circle of Heroes. Its six bronze plaques are mounted on stones that surround a flagpole. It's a place for people to stop along the Trinity Strand Trail in the Dallas Design District and remember. On July 7, 2016, a peaceful protest in downtown Dallas was punctuated with gunfire that killed five police officers and injured nine others plus two civilians. Look back at the sights and sounds of the 24 hours surrounding that tragic event. North Texas will commemorate the anniversary of July 7, 2016, with a wide range of community events. Here's a list that will be updated as more events are announced. A year ago, Lorne Ahrens, Michael Krol, Michael Smith, Brent Thompson and Patrick Zamarippa were still riding the rails and patrolling the streets of Dallas. Then came July 7. Mayor Mike Rawlings recalls how the city came through that night and the days that followed. Last July, the country's attention was focused on Dallas after a peaceful protest against police shootings of black men turned violent. 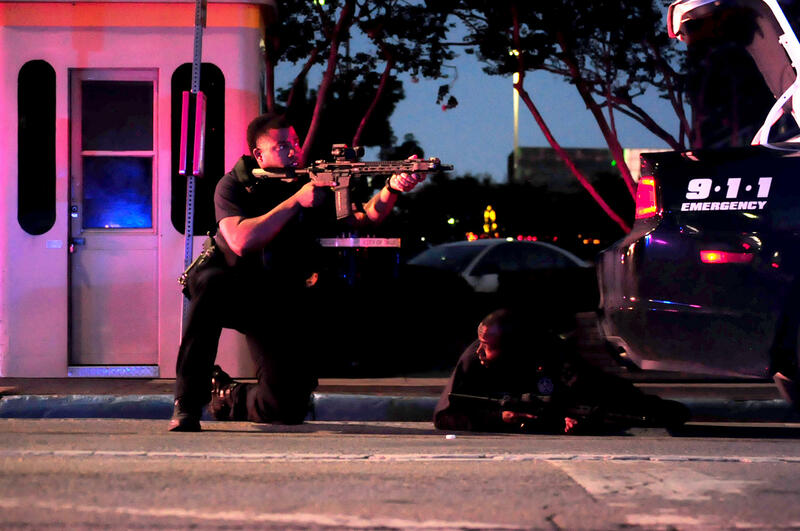 A single gunman shot and killed five officers. He injured nine more, as well as two protesters. After he was killed and the incident was over, Dallas Police Chief David Brown commanded the nation's attention. Hundreds gathered downtown Wednesday for the annual Dallas Police Memorial to honor the city’s fallen officers. This year's ceremony paid special tribute to the five officers who were killed last summer by a lone gunman after a peaceful protest was wrapping up downtown. 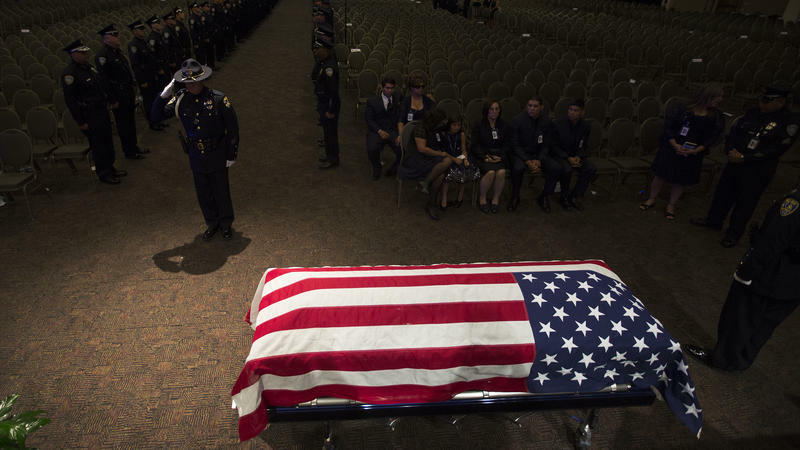 The number of law enforcement officers shot and killed in the line of duty increased sharply in 2016 relative to 2015, according to a preliminary report from The National Law Enforcement Officers Memorial Fund. The overall number of officer fatalities rose by 10 percent, remaining lower than the average for the previous ten years. In 2016, the state of police-community relations fluctuated with each deadly encounter between law enforcement and civilians across the country. Texas had one of the most high-profile events of the year, when a gunman opened fire in July on Dallas officers as a Black Lives Matter protest wrapped. The year was also marked by efforts to reform the state's criminal justice system, particularly jail conditions. The shootings of police officers in Texas and Missouri on Sunday were the latest in what law enforcement officials say is an alarming spike in ambush-style attacks. 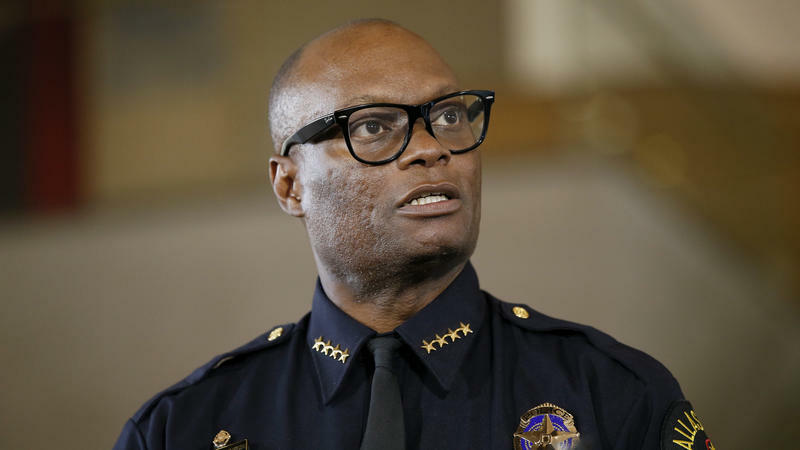 Dallas Police Chief David Brown has at least one job lined up after he retires next month: He said today that he's been invited to be commencement speaker at the University of Texas in Austin. In this series, The First Week, KERA's reporters are listening in on the conversations about race happening in and around North Texas schools. 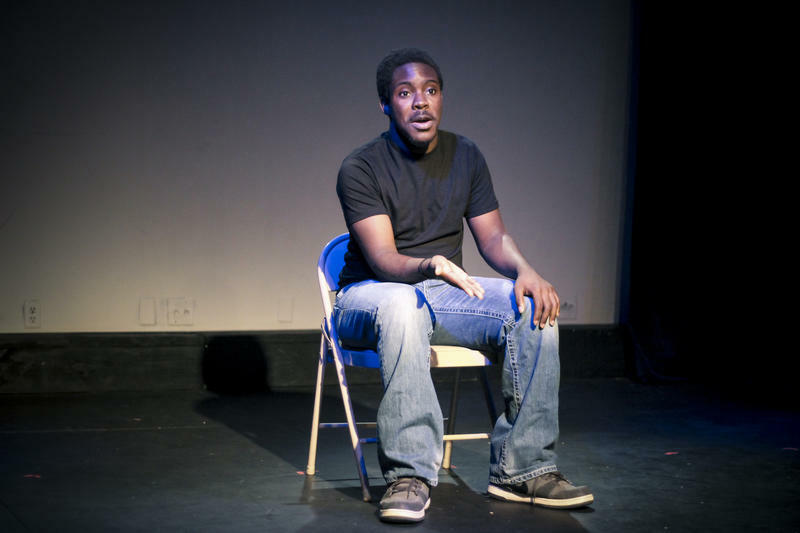 Today, what students are saying about the violence this summer: police killings of black men in Louisiana and Minnesota, and a gunman's July ambush that killed five law officers in downtown Dallas. On July 5, Alton Sterling was killed by police officers in Baton Rouge. Two days later in downtown Dallas, at the end of a peaceful protest against the police killings of Sterling and other black men, a lone shooter gunned down five police officers.